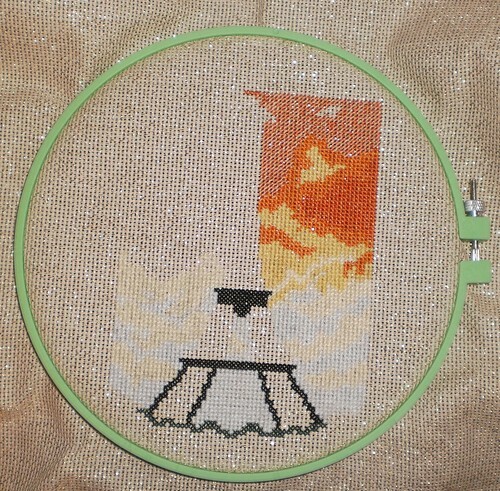 A couple hours of stitching and the sunset on the right side is taking shape. You can see how the change from doing all one color to working in bands makes this a bit easier. I did the medium copper, then a band of light copper and then the yellow and then back to the light copper. There's less chance I'm going to screw up the stitch placement. It possibly wouldn't matter as these are rather amorphous bands, but I want to be true to the designer's piece or why follow the chart. Last night, I worked another hour and a half, while dinner cooked. The medium copper of the sunset rules the top of the design. If you haven't figured out what this is, you might have a clue now. I have to work carefully as there are some spots of light copper in this upper right corner. This involves a lot of counting and referring back to the chart. Pilchard seems to finally understand that if she sits in my lap, I will scratch ears and chin occasionally as I work. 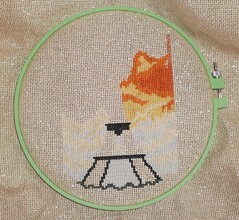 There's more chance of cross-stitching fur into the design, however, so I have to be vigilant. What you can't see in the photograph is how the glitter of the fabric adds to the sunset. I'm liking this, a lot. I hope the recipient likes it too.